Contact Cap & Seal directly via email. These are the metal tops that hold the aerosol valve together. This closure is crimped to the opening in an aerosol container. We stamp the closure with a very high degree of precision and affix a gasket system to the can sealing area. 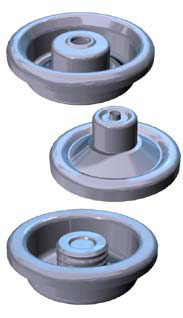 Includes can ears and compound lining for paint plugs and other metal closures. We serve the liquid candle industry with closures and gasket systems for their candle cartridges. We strive to design our manufacturing systems for quick-change and rapid set-ups. Our systems are conceived by the people who will be responsible for on-time and in-spec delivery. They are designed from the ground up to be reliable over the long haul and provide maximum flexibility to the customer. We strive to find the answers to our customers tough component issues. When EPA announced that our industry-standard GK-45 gasket material would be outlawed, we spent 10 years developing three proprietary systems that answered virtually all of our customer's needs for every application. Result? No customer missed a single delivery. When we found out that a customer was spending thousands of dollars to have a prototype shop make imitation closures out of imitation materials, we developed our own low-volume method of creating customer-specified profiles for their trials. This system has been expanded and now offers many customers the ability to try new ideas economically using the same materials as the final product. When a large, local customer needs a last minute schedule change to accommodate an emergency order, our response time is incredible. We are able to have 150,000 or more pieces at their door within 48 hours.